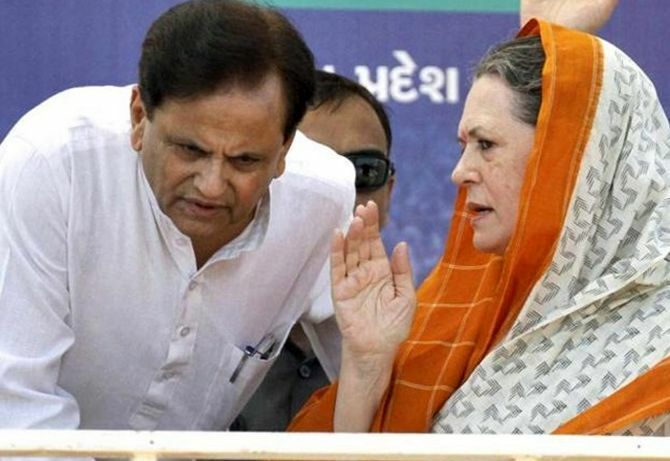 IMAGE: Then Congress president Sonia Gandhi with her political secretary Ahmed Patel. Remember Sheela Bhatt's exclusive interview with Ahmed Patel on Rediff.com five years ago? It was the first time that Patel -- Sonia Gandhi's political secretary -- had spoken at such length, and the interview created tremors in both the Congress party and its rival Bharatiya Janata Party. You can read it here: 1, 2, 3. Sheela has since moved from Rediff.com to the NewsX television network, where she spoke to Ahmed Patel last week after his boss stepped down as Congress president. We publish the transcript of the interview with kind permission. Sheela Bhatt: Hello and welcome to NewsX, and India News. Ahmed Patel is the former political secretary of former Congress president Sonia Gandhi. He is one of the most powerful leaders of the Congress party, but few know him. He rarely speaks to the media. Today we have the privilege to speak to him. Ahmedbhai, Thank you for joining us. How does it feel today to look back in time? First of all, I have an issue with words like 'powerful', 'political secretary'. I was never powerful. As a political secretary, I did whatever work I was given with righteousness. First of all, tell me how was your journey working with Sonia Gandhi? And how do you feel today about it? I am glad that I got to work with Soniaji for so many years -- first as treasurer and then as political secretary. One always feels happy working with her. It is fun. It is also a form of encouragement. I have never faced any problems in working with her. You remember what happened in 1999 when Mr Sharad Pawar, Mr Tariq Anwar and Mr P A Sangma said Sonia Gandhi is an Italian, she is a foreigner. Can you tell me how you handled that situation and how Soniaji reached where she is today? It was team work. This question was not just raised by members of the Congress for the first time. The Opposition had been raising this question since forever. So this wasn't new. You know there is always competition in politics. So when this question was raised within the party by members of the Congress party, it was a little hurtful. Soniaji felt troubled, other Congress members felt troubled too. But the majority of Congress workers, the common workers, wanted that Soniaji should come into politics, she should become the Congress president, and she should lead us. So everyone got together -- it was team work. At that time Pranabji (Mukherjee) was with us, other people were also with us. And since the group of people who had raised the question was very small, we were able to get out of it easily. How did the transformation in her happen? It was very difficult for her. As she said in her speech, after marrying Rajivji is when she learnt some politics. It was a new thing for her. Still, understanding it as her responsibility towards the party and the country because the Congress was ready to break down. People were leaving the Congress and it seemed like the Congress would be finished. Hence, she felt if she did not take up the responsibility -- the Congress people wanted that Soniaji from the Gandhi family should lead -- then the souls of Indiraji and Rajivji, who had been murdered, would be hurt. Their sacrifices would be a waste. Along with that was her duty towards the nation. The atmosphere that was there was of communalism. She felt if my leadership can help the Congress stay together and fight these challenges, she felt she should come into politics. Mostly, apart from a small group of people, everyone else helped her and she accepted the responsibility. A lot of people -- in the Congress Working Committee, the core group in your party -- say that after Sonia Gandhi became party president, she always had it in her mind that she would make Rahul Gandhi Congress president. This is completely wrong. This isn't true. Amethi and Rai Bareli are two (Lok Sabha) constituencies. Naturally, Rahul Gandhi contested from one constituency (Amethi). This is how he came into politics and became (Congress) general secretary. There was no intention at that time that he had to be made the Congress president. As time passed, she had health problems. She could not do as much work as she wanted to. So Rahulji took up some of her responsibilities. He started meeting people. Then came a time when the people in the Congress only wanted that Rahulji should become the party president. Some people met her and she said if you all want and the Congress wants, then I have no objection. But it was never that she wanted to make her son the Congress president. I have never met Soniaji neither do I know her personally. It is through reading about her that I am telling you that it was the heart of a mother and the duty of a daughter-in-law of the Gandhi family that has had a strong impression on her. And if today Rahul Gandhi has become the Congress president, these two things are important in that case as well: A mother's heart and her duty. I do not agree with this. On the contrary, she prioritised her duties toward the Congress and the country. She said I am getting older, my health isn't up to the mark. Congress people also wanted that a younger leadership should take over so that he or she can work on the challenges that the country is facing. There was a controversy after she said she wants to retire. People felt she wants to retire from politics. In the evening a clarification was issued. So what is the truth? She is a member of Parliament, she is still CPP (Congress Parliamentary Party) chairperson. She is retiring means she is stepping down from the position of Congress president. What will her role in the Congress be now? Only she can answer this. How active she will be; whether she will remain CPP chairperson or not, that she will decide. As her political advisor, which moments have been the most difficult for you? Political secretary... Of course, the elections of 2004, 2009 and in any such situations where the party lost or where there was need for firefighting or some problem in some state. Along with my colleagues we tried to solve such situations. What do you consider the most difficult moment? Was it when she said she does not want to become prime minister? Everyone wanted that. (They felt) the mandate was for Soniaji, but she didn't want to be PM. A lot of people felt hurt. That I can't say since it is confidential. That will stay with me. The other challenge we faced when the issue of nuclear voting came up (the motion of no confidence in the Lok Sabha against the Manmohan Singh government over the nuclear deal on July 22, 2008). The nuclear deal was a tension because we felt maybe the government will collapse. In retrospect, do you think it was good that instead of Sonia Gandhi, Manmohan Singh became the PM? It was her feeling that instead of her, Dr Manmohan Singh would be a better PM.